Knauf acoustic ceiling systems help reduce noise. The company, which has been operating in the Gulf region for more than 15 years, has been involved with a number of prestigious educational projects in the UAE. It is currently supplying acoustic ceiling systems to Abu Dhabi Future Schools programme, having been engaged in many ongoing education projects under this programme; Al Shuwaib School in Al Ain; Shuwamekh School in Abu Dhabi; Shoba Hartland School and American School in Dubai.Knauf AMF, a leading European manufacturer of high-quality acoustic ceiling systems, has been transforming noisy classrooms into calm learning environments with its state-of-the-art systems. “A child’s ability to hear and understand what is being said in the classroom is important for learning,” Sreejith Panicker, Knauf AMF’s director – operations for the GCC region, points out. He explains that poor classroom acoustics are caused by lengthy reverberation time and background noise, which can be so high that they interfere with teaching and learning – which can affect speech intelligibility, attention and concentration, behaviour in the classroom, academic achievement, and health, including voice strain and headaches. “Background noise is any unwanted sound that interferes with what you want to hear. It can be outside noise coming in or transmitted from adjoining rooms and internal noise produced by either the pupils themselves or machinery, which can soon build up and become another distraction for the teacher and pupils. “Reverberation is the persistence of sound in a room because of sound reflecting off surfaces, for example, walls, ceilings, desks or chairs. When sound lingers in a room, there is more interference with speech. In a classroom, it is important to have a short reverberation time,” says Panicker. Knauf AMF provides a cost-effective solution with its acoustic ceiling system to help reduce intrusive noise in the classroom. These ceilings absorb sound and offer sound insulation, thus reducing the amount of reverberation in the classroom and insulating it from external noise. “A room fitted with acoustic ceiling tiles can change a noisy environment into a calm space where teachers and pupils can hear one another clearly; concentration and attention spans are increased, enhancing work efficiency and well-being for both staff and pupils,” he says. Knauf AMF acoustic ceilings (www.knaufamf.com) can help transform schools into a calm learning environment. 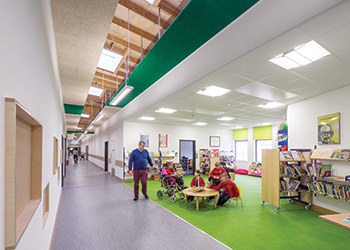 These ceilings were recently installed at the St John’s Church of England Combined School in Princes Risborough, UK, which once suffered from poor acoustic conditions in its classrooms. • Allow easy access to the services above the ceiling. As a technology leader in multi-functional ceiling systems, Knauf AMF offers product lines that address environment issues. “As a European manufacturer, we take the sustainability of our production as well as our products extremely seriously, as strict European laws demands the same. We exceed requirements set by the European Union with regards to sustainable manufacturing. All of our raw materials are transported within 500 miles from our state-of-the-art factories and we use what’s known as a closed loop production method, which involves recycling all possible excess material and harvesting even excess energy from our large-scale dryers to heat most of the office buildings within the premises,” says Panicker. During the last five to seven years, the company has invested more than €60 million ($69 million) by adding the latest machinery to enhance the efficiency of the production facilities. As a result, the energy consumption has drastically reduced so there is also a commercial benefit as well. “We avoid air freight of materials to almost all of the 90-plus countries that we sell into worldwide and use sea freight to reduce our carbon footprint. Our products, on average, have 35 to 40 per cent recycled material content and are completely bio-degradable. We are also piloting an old material collection scheme in certain markets so we could recycle them,” he adds.